This week was filled with several season finals of my favorite TV shows, and some of them have been really heartbreaking. On Stardoll though, I didn't have much fun as my Royalty membership ended, but still, let's see what we got this week. On Monday, we got new Mawi jewelry collection. Mawi strikes as unusual jewelry store, with many colorful pieces. Especially popular, in real life too, are the earpieces. I love the store overall, and the background is pretty cool, so I like they made it available as well. On Wednesday, you know it - new Callie's Picks, collection named 'Easy Breezy'. Collection is preparing us for warm, Summer days. Though it felt more like Winter last week or so. Pieces are kinda ordinary, casual, perfect for warm spring days or evenings. I like the denim, and light fabric of some of the clothes. Hoping for Spring days to finally arrive here, or even better, Summer - warmer the better. 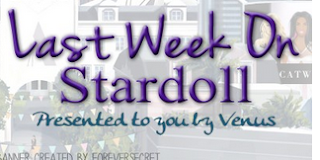 On Thursday, Stardoll announced new top up offer. The offer is 'only' 15% extra stardollars for topping up, tough you could get them by renewing your membership as well. They usually make offers like this before new limited stores, but this time, they gave us spoiler on the very advertisement. So you had a nice incentive for topping up, but honestly, 15% is a bit too little, we could have gotten at least 30%. And on Friday, we got new Antidote collection. The collection was based on 'street style', and there is a lot of denim, black items, prints. Surprisingly (or not so), some pieces sold out pretty fast. Whole collection did really sell out quicker than usual, compared to other collections. Many prefer it over LE (lower prices), or SAP (too few skintones). There were few pieces I really loved, but not worth renewing my membership for. And that's it for the week. We already know what we are getting tomorrow, so I hope you still have saved up some stardollars, or even better, collection isn't limited. It would be just too much having 2 limited collection in 4 days. Anyway, vote on the poll, leave a comment, and see you next week.